Over 25% lighter than steel, these All Aluminum shelving units are constructed with .100 3003 H14 Aluminum and engineered to support loads comparable to their steel counterparts. Each of these 16" deep shelving units fit closely to the side wall of your van freeing up valuable floor space. Available in two versions, the ProMaster models have a straight back and bottom shelf clearance of 18" to allow mounting over the vehicles higher wheel wells. The second version, for Transit and Sprinter vans, comes with offset backs to conform to the vehicles side walls and standard 13" wheel well clearance. Over 25% lighter than steel, these All Aluminum shelving units are constructed with .100 3003 H14 Aluminum and engineered to support loads comparable to their steel counterparts. Each of these 16" deep shelving units fit closely to the side wall of your van freeing up valuable floor space. Available in two versions, the ProMaster models have a straight back and bottom shelf clearance of 18" to allow mounting over the vehicles higher wheel wells. The second version, for Transit and Sprinter vans, comes with offset backs to conform to the vehicles side walls and standard 13" wheel well clearance. Units for ProMaster vans include four 16" deep shelves while the Transit and Sprinter units include two 13 ½" and two 16" deep shelves. Each shelf has a 3" lip and is slotted on 4" centers to accept optional drop-in dividers. 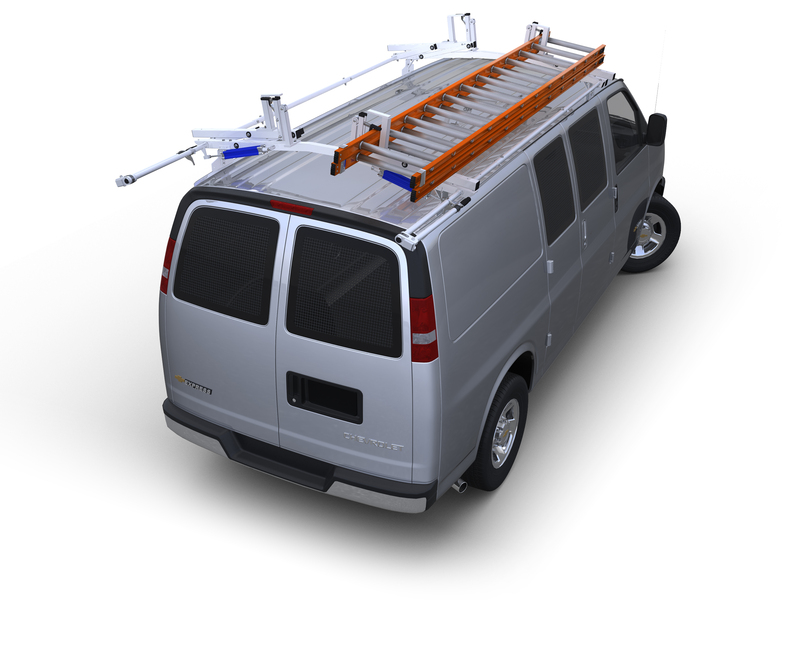 Each unit comes completely assembled with all necessary hardware and mounting brackets, ready to install into your van. Units also include Shelf Liner for each shelf, made of polyester webbing coated with PCB foam. Units fit Sprinter and ProMaster Standard Roof and Ford Transit Medium Roof vans. SAVE 10% on Divider Kits (sold above) which include three dividers per shelf on the unit.